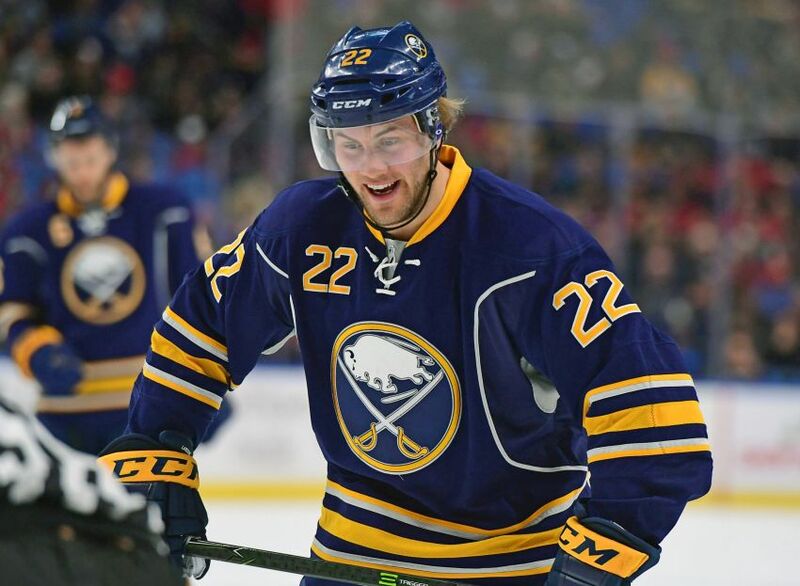 BUFFALO – The scouting report on Johan Larsson, the tenacious center Sabres coach Dan Bylsma often charges with shadowing the opposition’s top forwards, is short and straightforward. “He’s grumpy, miserable, hard guy to play against,” Bylsma said Tuesday after the Sabres prepared for tonight’s tilt against the Detroit Red Wings at KeyBank Center. Wait, the quiet Larsson, an affable, well-liked teammate known as “Larry,” is grumpy? How often does that word appear in scouting reports? Larsson, 24, usually pivots a checking line beside Foligno and captain Brian Gionta, a trio that quickly became the Sabres’ steadiest last winter. With top center Ryan O’Reilly injured and Sidney Crosby in town Saturday, Bylsma promoted Larsson to the No. 1 line to help stymie the Pittsburgh Penguins superstar. The Swede mostly held hockey’s biggest talent in check all night – he skated a season-high 22 minutes, 26 seconds – as the Sabres’ 2-1 shootout win ended a six-game losing streak. In Monday’s 4-2 win against Calgary, Larsson scored the go-ahead power-play goal and also went head-to-head with top Flames forwards Mikael Backlund and Sean Monahan. Barely a year ago, Larsson couldn’t get into his own uniform. He had thrived during his brief run as the Sabres’ No. 1 center at the end of 2014-15, scoring five goals and 14 points in the final 19 games. But he struggled early last year as he tried to adjust to a lesser role under Bylsma, who scratched him three times before November ended. Larsson finally scored his first goal Dec. 14, his 28th appearance. By the wintertime, Larsson began developing into a sturdy and clutch two-way presence. Incredibly, seven of his last 13 goals have been game-winning scores. “Starting at about the 35-game mark, the 40-game mark he grew into the role and the player he can be and is being for us right now,” Bylsma said. What helped Larsson morph from a fringe player into a reliable presence? Sabres newcomer Kyle Okposo said he didn’t know much about Larsson, his new linemate, before coming to Buffalo this season. “He’s one of those guys you don’t really noticed him too much when you’re on the other team,” Okposo said. “But when you’re playing with him, you realize how good he is and how many little plays he makes. Larsson’s run on the top line could end tonight. O’Reilly, out the last five games with an oblique injury, skated in the Sabres’ optional practice Tuesday and could return. If that happens, Larsson might go back between Foligno and Gionta, a place he feels comfortable.